Collagen Peptides - Do They Really Work? All your questions answered. Collagen peptides are one of the fastest-growing phenomena in the world of supplements. Why? Collagen is one of the single most important proteins in our bodies. It acts as the scaffolding in the body, giving structure and support to our bones, teeth, hair, skin, nails, joints and connective tissues. Collagen supplements bolster this existing architecture as your body produces less and less collagen as you age, preventing wrinkles and easing joints. Still, there are questions you should always ask before adding another supplement to your routine. This week on the blog, we’re bearing the facts and guiding you through the potential conflicts and exciting possibilities of collagen peptides powder. First an introduction is due. Collagen peptides are a soluble supplement derived of marine or bovine (cows) protein. Bovine collagen peptides, favored for their compatibility with other vitamins, are made from the hide and connective tissues of cows. These peptides are rich in Type I and Type III collagen, good for skin, bone, and joint health. Most are flavorless and dissolve completely in hot or cold liquid. Collagen peptides contain the same reparative amino acids that are found in the gelatin of bone broth. Trusted brands recommend taking one serving daily to see complete effects. This is a great question. Our primary concern with all supplements should be safety. However, you need to understand first that all collagen peptides are not created equal. Marine and bovine are the two leading types of peptides on the market today. They are fairly harmless with three minor risks. First, be mindful of taking peptides with calcium supplements. Marine collagen peptides are higher in calcium levels than bovine, however, both do contain calcium. Hypercalcemia is extremely rare, but possible in some cases. If you have a history of issues consult a doctor before starting regular use. Another potential concern with marine collagen is risk of allergic reaction. Avoid marine supplemental products if you have an allergy or sensitivity to shellfish. Finally, the greatest risk collagen peptide users face is bad aftertaste. Those who opt for marine collagen report a slight fishy smell or aftertaste, whereas bovine collagen users note a hint of soup. The easiest way to avoid this? Get creative! Mix your peptides into a smoothie, your morning coffee, or into your sauce at dinner. The benefits of peptides expand across the body. Athletes who use the powder have reported quicker recovery times as well as improved joint function. Beauty lovers across the board are also singing praises. These peptides have shown to improve brittle nails, damaged hair, and fine lines & wrinkles. Then there are those who regard this supplement as vital for gut health. These peptides digest just like our neighborhood friend bone broth, if not better! This life-saving collagen smoothes and seals the lining of the gut. 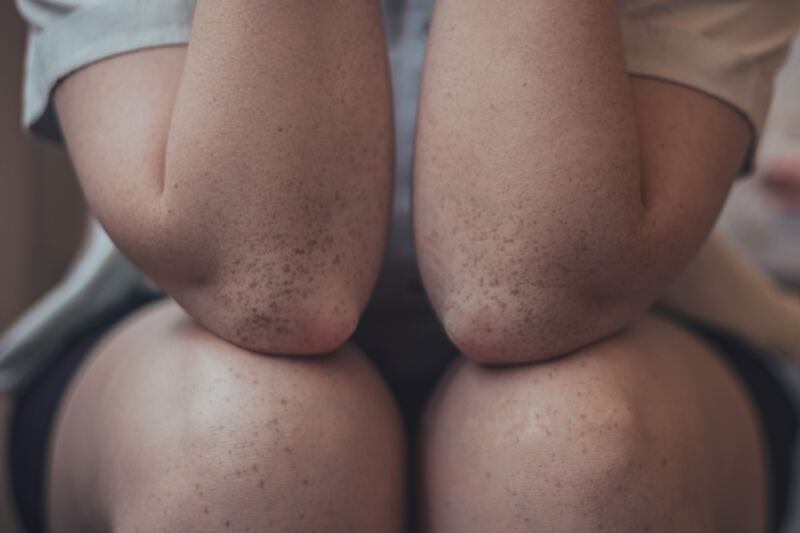 Those who suffer from IBS, Hashimotos, and Candida often use collagen peptides or other collagen rich products for flare ups for these reasons. Do collagen peptides really work? This is the answer you all have all been waiting for so patiently. The short answer: yes. When collagen peptides are used as directed they have been shown to complete dramatic results. In a study done with mice, scientist have found bovine peptides effective in treatment of osteoporosis and osteoarthritis. Additional collagen in your diet could even be life changing for those suffering with lifelong illness. However, researchers find one common pit fall among those who did not see results. Healthy diet and exercise are vital to success with any supplement regimen. Consult your doctor or a nutritionist for more details on how to incorporate peptides into your personal health routine. 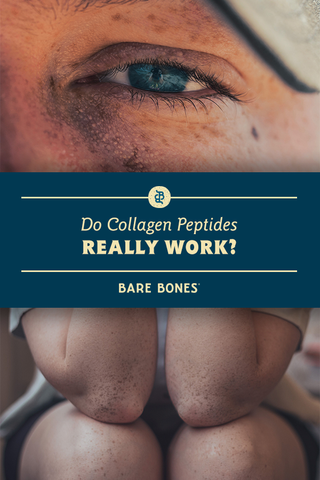 Do you have more questions about collagen peptides? Will you be trying this supplement? Do you just want to say hello? Let’s chat in the comments. 6 Replies to Collagen Peptides: Do they really work? Thank you for the review Hannah. I am curious if you, or anyone else recommends a trusted brand? Hello there Mori! I 100% recommend Bare Bones’ own grass-fed Collagen Peptides because I use them myself every morning. There are also some discounts floating around for the Launch Party now if you’re subscribed to the Bare Bones newsletter 🙂 Check the link below! Learned some new stuff with very detailed information. Thanks for sharing the article! Thanks for reading, you’re very welcome! Thank you for your honesty Ryan regarding possible safety concerns regarding these type of peptides. A lot of articles out there kind of skirt around them and do not like to discuss it. Very interesting post, thanks. Anytime Sharon! We try to be as objective as possible, especially surrounding health claims and such. As with most new things, there’s tremendous anecdotal evidence of bone broth and collagen providing benefits, there’s still very little science-based evidence. Cheers!